According to scientists at Oregon State University (OSU), a strain of edible seaweed called “dulse” is the new superfood. This seaweed, recently patented by OSU researchers, grows wild across the Atlantic and Pacific coastlines and is packed with an abundance of vitamins, minerals, antioxidants, and protein. Scientists note that it has double the amount of nutritional value of kale. OSU researchers originally used this strain of seaweed, which resembles thin red lettuce, as a food source for abalone, or small sea snails. When researchers discovered how quick the abalone grew after being fed dulse, they began to think humans could benefit from the seafood even more. Dulse can be farmed and eaten fresh or it can be processed into several food products. 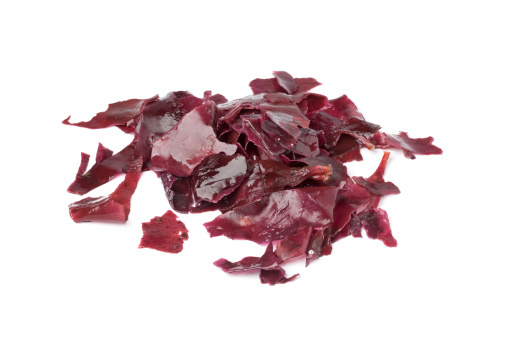 Some of the first products using dulse include dulse-based rice crackers, salad dressing, and even dulse “bacon” strips. These strips have really piqued people’s interest because of their smoky bacon flavor; it is created when dulse pieces are fried the same way one would fry bacon. As of yet, there are currently no commercial operations. However, within the Portland area, chefs have already undertaken the task of developing new recipes and ideas to incorporate dulse into their menus. The Associate Press, “New dulse seaweed tastes like bacon, Oregon researchers say,” CBC web site, July 16, 2015; http://www.cbc.ca/news/health/new-dulse-seaweed-tastes-like-bacon-oregon-researchers-say-1.3155017.